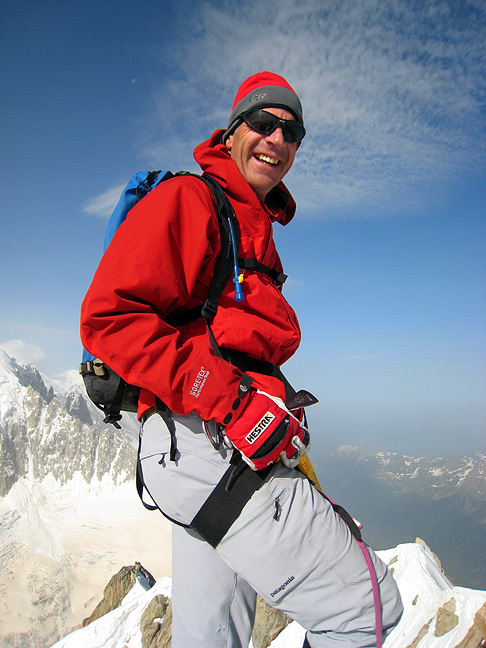 Once again Jay Riley was back in the Alps, his home away from home, it seems. This time we enlyed two very big routes, in excellent condition. 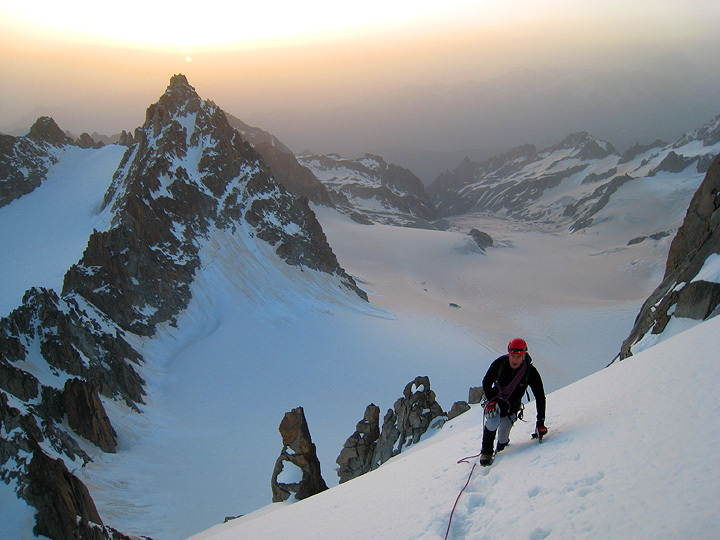 Our first climb was the Forbes Arete on the Aiguille du Chardonnet. The weather was dry, though decidedly strange, with thick haze, as though Italy was burning to the south. But the forecast was good, so, in spite of the only marginal freeze the previous night we carried on. 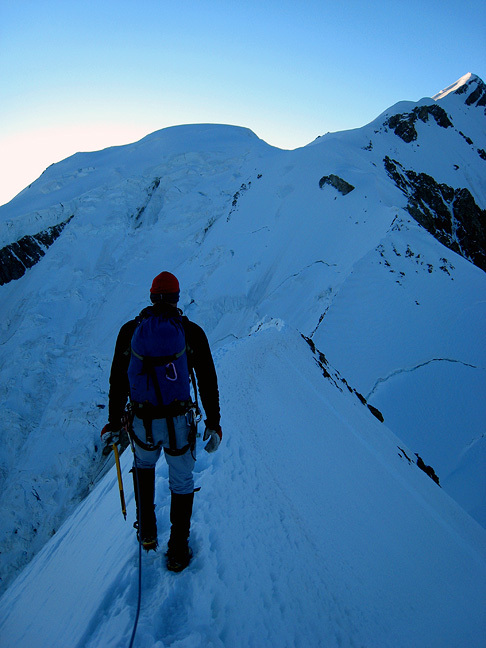 Here, just a bit after dawn, we are just reaching the ridge proper. Another party on the route, just behind us. Every once in a while, the good steps on the route would unexpectedly collapse. Not so fun. Jay, not far from the summit. 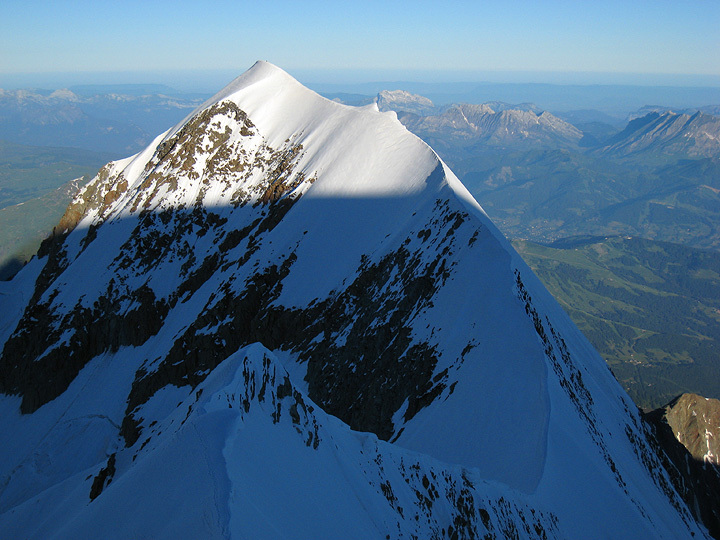 A photo from the summit showing another party just starting the descent. 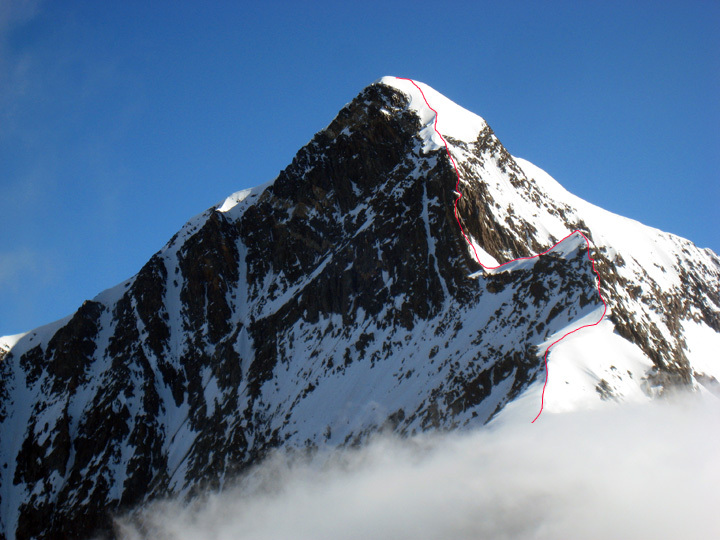 Quite the knife-edged ridge. And the summit photo. 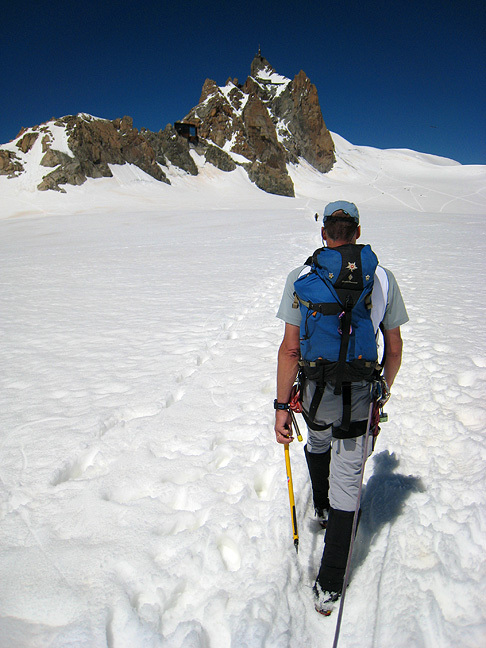 The descent was uneventful, with good snow cover on the lower glacier. 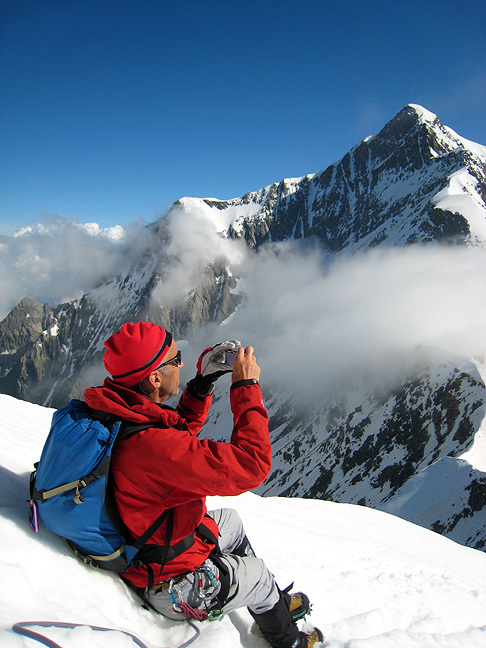 The following day, we made the trek up the Conscrits hut. 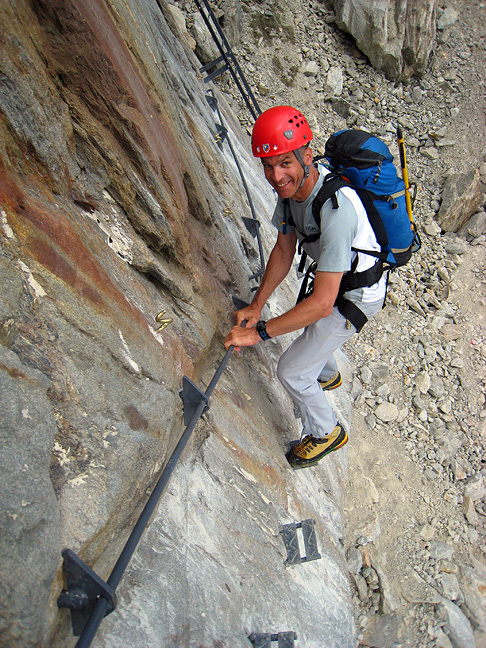 The route includes a bit of interesting iron foot and hand holds. 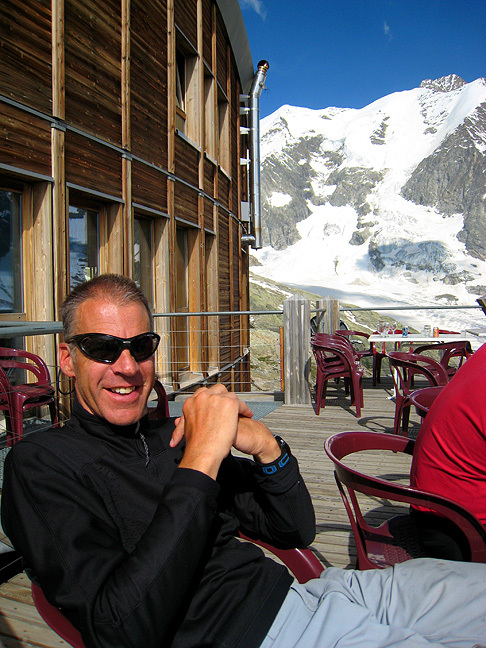 Jay relaxes on the terrace of the hut. 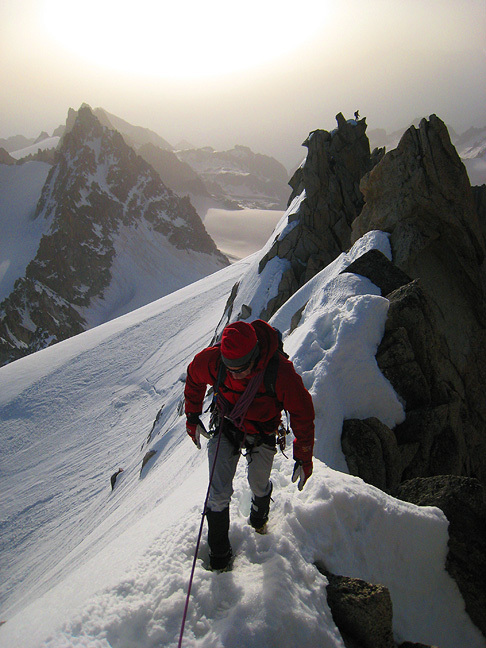 The following day, our fourth, we traverse the Domes de Miage. 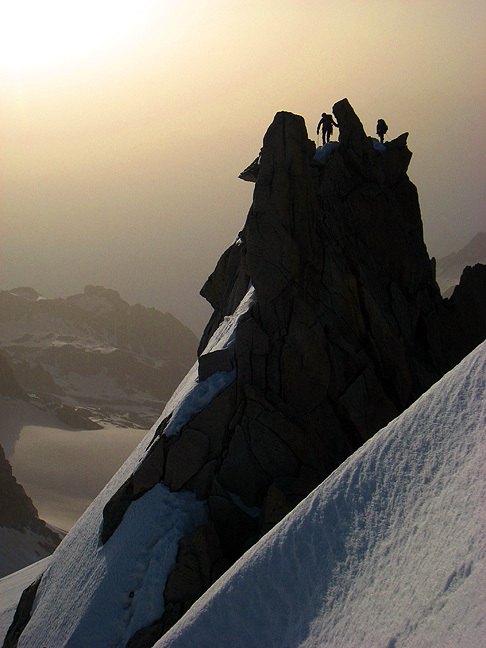 Much of this route was in the mists, but we did get one clear view of the Aiguille de Bionnassay. Tomorrow's route is marked. Mont Blanc is out of view to the right. Pausing for a photo as we descend the Miage to the Durier hut. 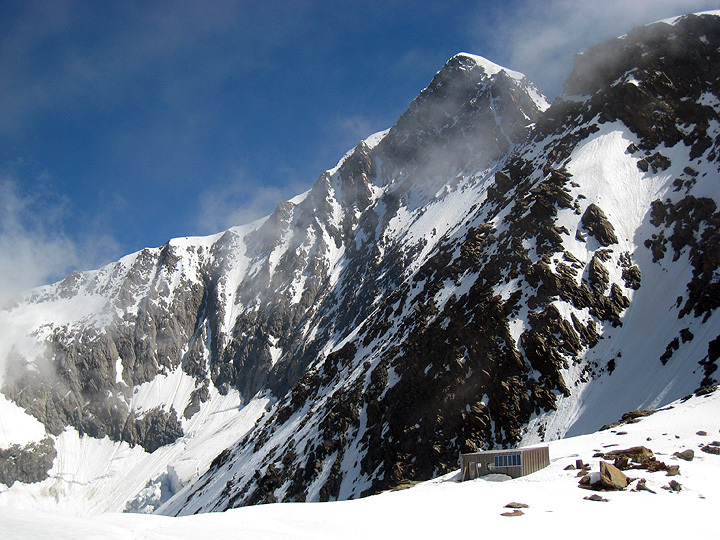 Approaching the Durier hut. Mont Blanc still looks long way off. Finally, the hut is in view. With an early start, we were on the summit of the Bionnassay just before dawn. 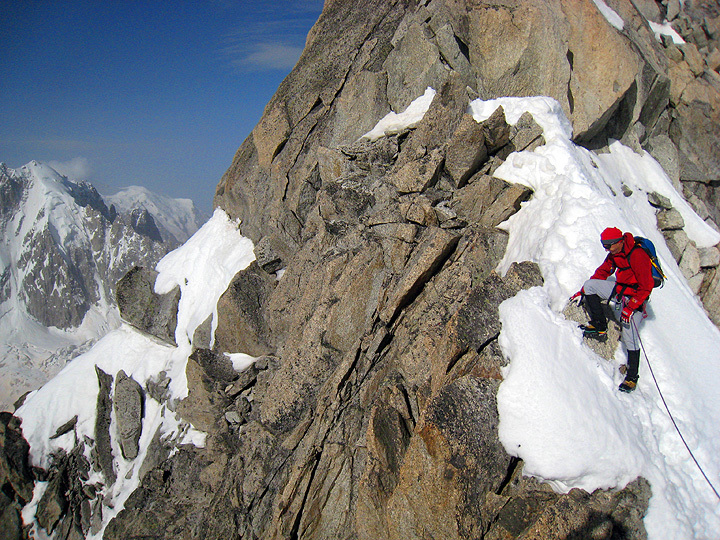 Traversing the classic snow ridge of the Bionnassay, heading towards Mont Blanc. 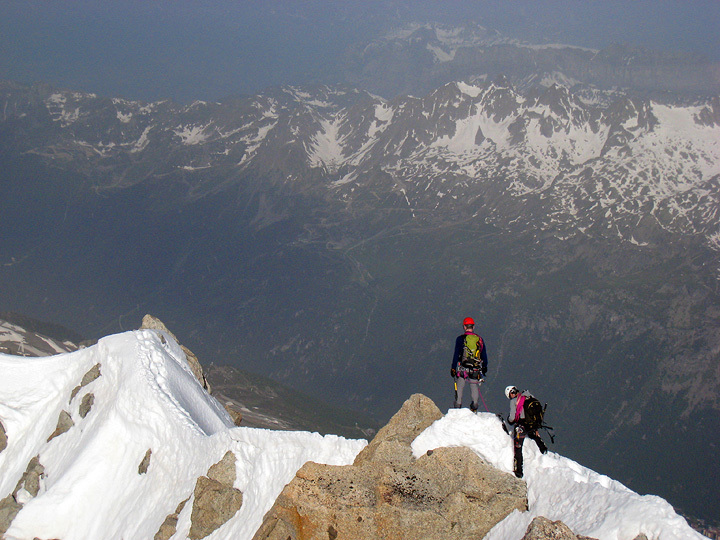 Looking back towards the Bionnassay as we climb up the Dome du Gouter. 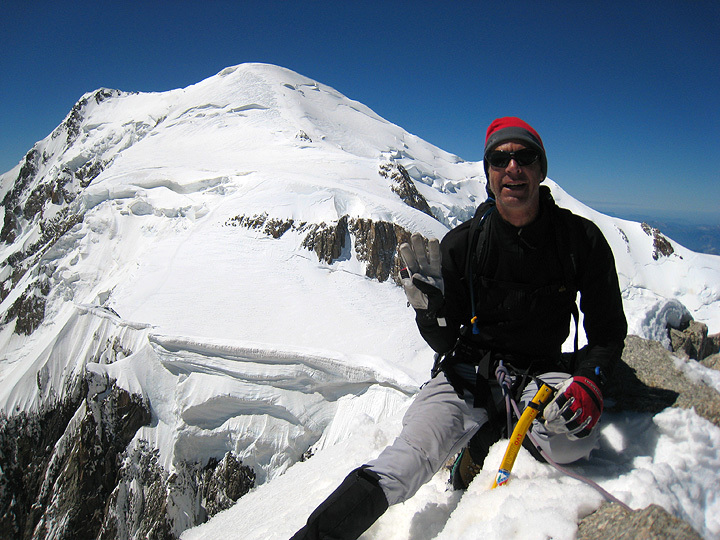 And, at last Mont Blanc's summit. 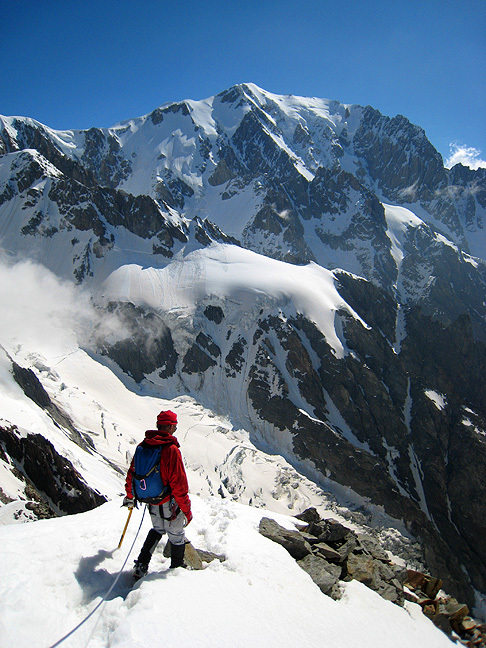 With the "Grand Traverse" in mind we head off down towards the Aiguille du Midi. 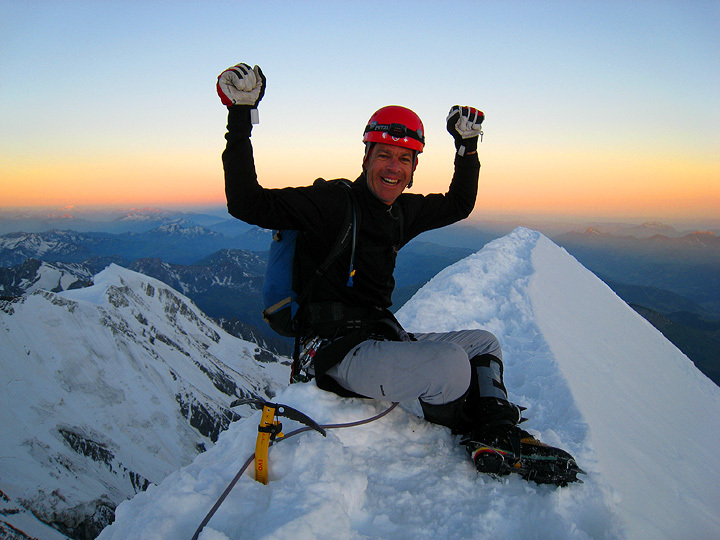 Ever the "Energizer Bunny" Jay suggests we tag the summit of Mont Maudit as we pass by. Three fingers shows our third summit of the day. 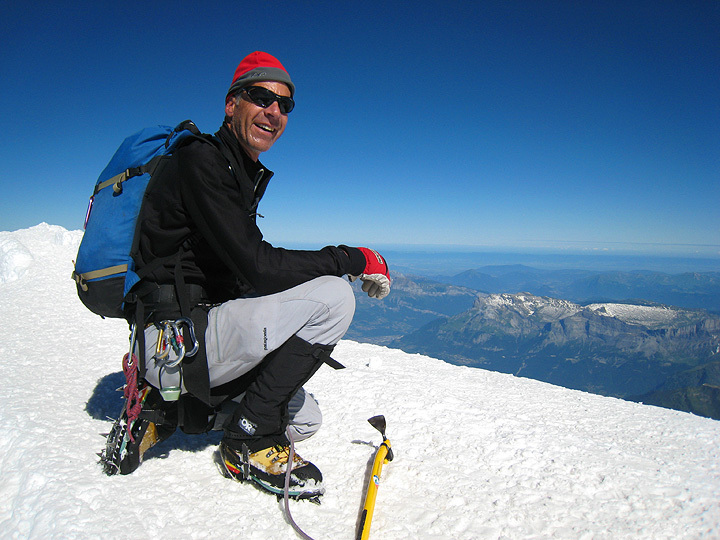 And at last, we walk the flat glacier and final climb up to the Aiguille du Midi and the cable car back to the valley. The final steps of a very long day.